Brand Backer teamed up with the makers of One Direction's Make-up line to have us try it out before it hits the stores! 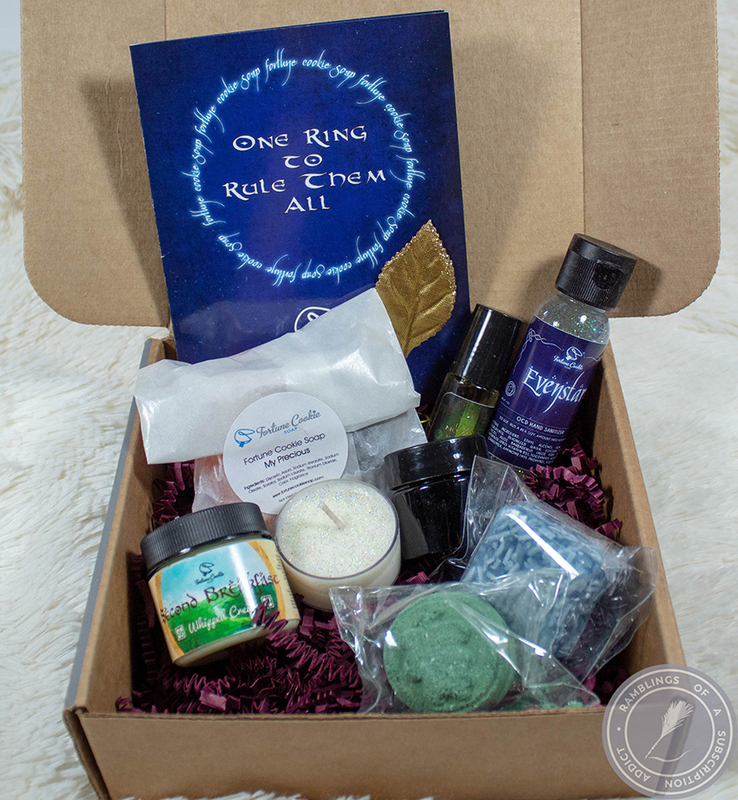 I have to say, I was not expecting it to be so colorful and have so many products to try, but I was pleasantly surprised! This picture is with flash, to show the true-ness of the blues. It was difficult to photograph and keep the pinks and the blues both true, so the second photo is without flash to show the pinks better! First up is 1D Electroglam Colored Mascara which retails at Macy's for $16.50 currently. As you can see, this is a three pack of mascaras, which is insanely cheap considering the cost of some other color mascaras I've seen recently. The other amazing thing with this product is that you can use it on your eyelash tips for a serious color boost or on your hair for electric highlights! There is the blue (Why don't we go there? - Shock of blue), pink (Does he know? - Pinkest hot pink), and yellow (Story of my life - Amped canary yellow). I find this amazing that it's marketed for both lashes and hair, because I would have totally used these all the time on my hair, especially in middle school. The colors don't pop as well on my hair as they could have, but that really has to do with how dark my hair it currently. I know these would work amazing on blonds or people with lighter brown hair, so I definitely want to try them out on someone like that. With a few swipes, though, they still showed out on my super dark hair. This would be a great present for 1D lovers or just anyone that loves using hair mascara! 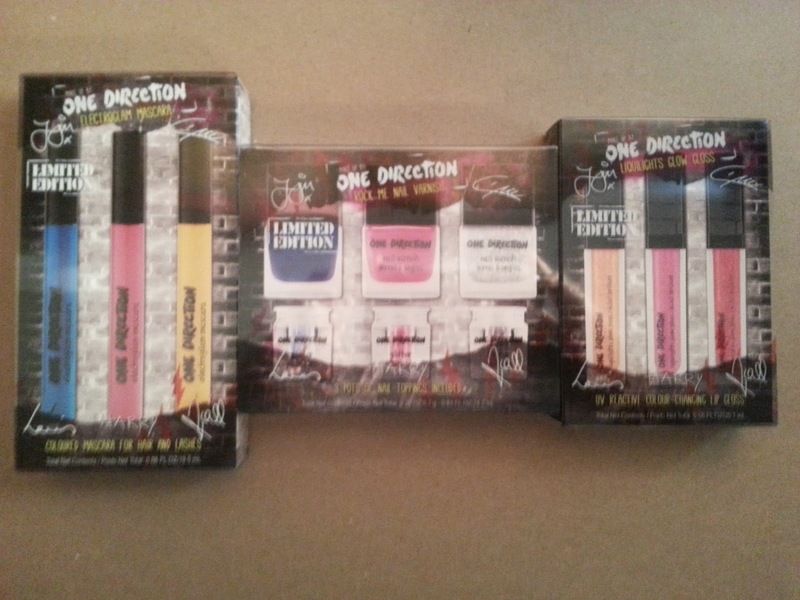 Next is 1D Rock Me Nail UV Set which is at Macy's right now for $16.50 as well. This set is three polishes and three matching glitters, and we all know how much I love nail polishes! For the price, the polishes and glitters are a pretty good size. The colors are blue (Happily - UV iced blue), pink (Moments - UV neon pink), and silver glitter (Diana - UV 3D holographic). The glitters are blue glitter (Kicks - UV snow cone blue glitter), pink glitter (Not Afraid - UV electrified pink glitter), and silver glitter (Star - UV holo glitter). I'm not a fan of them calling the sliver holo, but only because I have true holographic polishes and these just didn't fit in with what I think of holographics. The polishes definitely aren't up to indie standards, but do fit in with drugstore/mainstream polishes. They are decent and definitely a great buy for kids/teenagers who are just getting into polishing or love 1D. 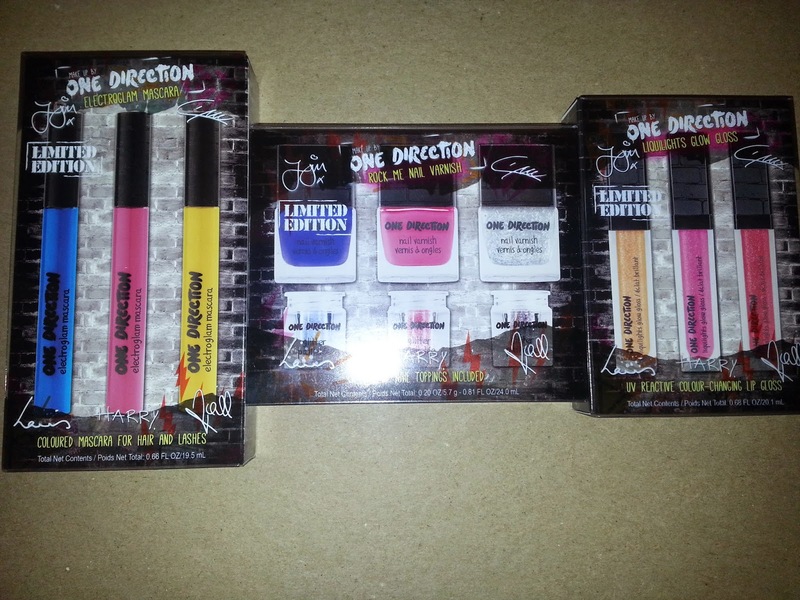 Finally, there is the 1D Liquilights UV Lip Gloss Set which is also at Macy's for $16.50 currently. This is a three pack of glosses that definitely have some variation. They have a nice shimmer and look great on their own or on top of a lipstick to make the color bolder. With these, the color completely changes under a UV light, so I will tell you what the colors are with and without a UV. I do not have a UV light accessible to photograph the UV change, so you just have to trust me on this! ;) The colors are orange/yellow (Kiss you - orange glitter/neon yellow), pink (Taken - glitter pink/neon orange), and red (Through the Dark - poppy/neon red-orange). I love the differences between the colors and like how all of them look in one way or another. 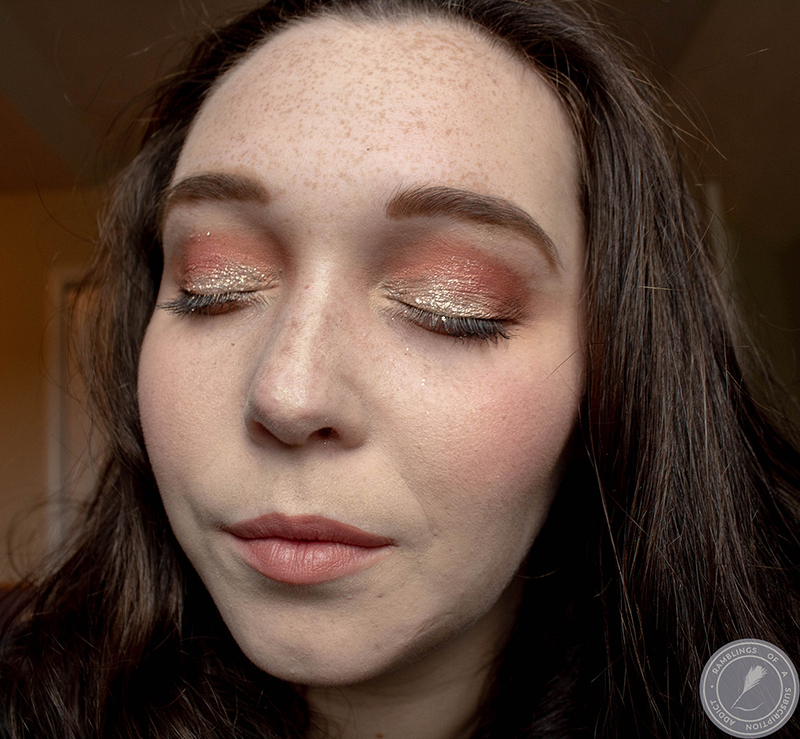 The orange one is great for putting over a deep red to tone it down some, which is the only way I can wear deep reds. The glitter in these are definitely for people younger than myself, though, so I don't see myself wearing these too much. It's definitely bigger glitter pieces than I would have preferred, but I will use them occasionally. 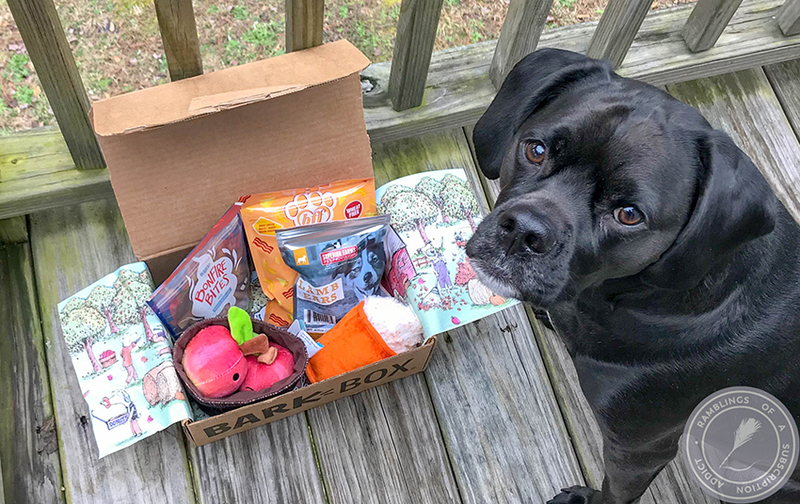 Now it's time for Giveaway information! Sponsored Post - Brought to you by Brand Backer.